76A The Hidden Gem is situated at the rear of a period building, a few steps away from local restaurants and shops. Only 5 mins walk from the train station and close to all the historical sites in Winchester. 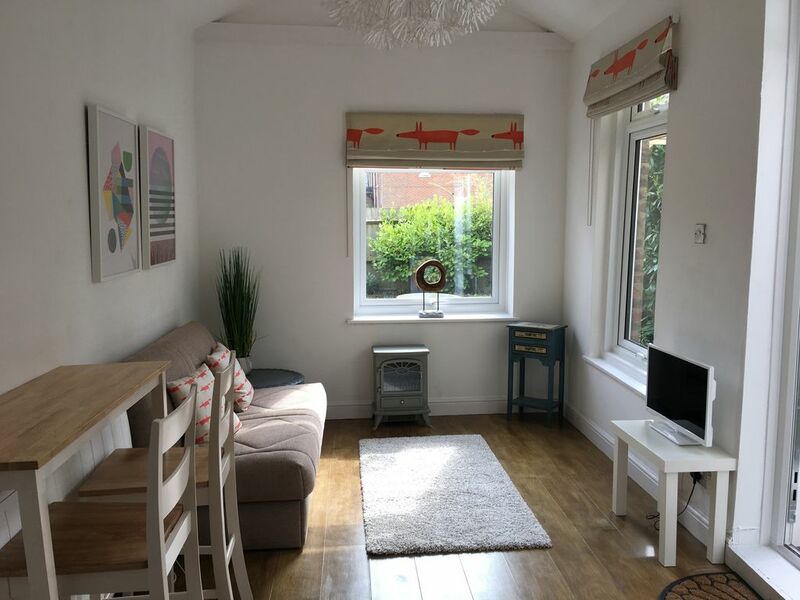 This is a ground floor garden flat, cosy, comfortable, modern and light, with stunning high beamed ceilings, large bright windows and a lovely small private garden. With a bright and snug bedroom and an extra sofa bed. The property is almost detached to the rear of a period building, very private, quaint and quiet with a lovely small garden. A ‘hidden gem’ that’s accessed from a main road to the front. Directions and check in instructions were comprehensive and sent well ahead of our arrival. The flat is small but very well equipped and clean. The little garden was lovely to sit in and the location was ideal for accessing the centre of Winchester. The high street Is less than 5mins walk away. The stairs to the bedroom are very steep so not ideal for old or very young guests. The host was very helpful and replied to my queries promptly. I would definitely recommend this property.